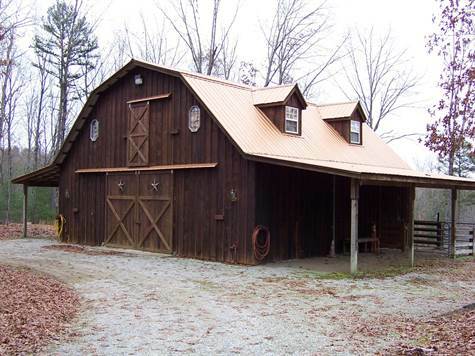 Unbelievable barn on 4.49 Acres. Land is at the end of a private road with only three other property owners. It has already been cleared and fenced with a 4 board wood fence all the way around. Septic tank with RV hook up is in place. The barn has a 900 sq.ft finished apartment upstairs. Also has four stalls, concrete floor, Washroom, half bath and large enough loft for all the hay you can store. Additional land is available. Must see this! Trail leading into the Big South Fork Park is just one hundred yards away. 2.75 acre pasture with 1,200 feet, 4 board wooden fence ----- 40 ft. 5 board wooden round pen with sand base. water and septic system already in place. 400 AMP electric service / under ground service stubbed to build site. stalls have wooden sliding gates. 12 x 12 wash stall – work area – w/floor drain. toilet / sink in tack room. concrete floor in center aisle, wash stall and tack room.